It's no where near as scary as it looks. StriVectin is one of those brands who don't really wow you when you look at the packaging. My first exposure to it had me nervous and a bit scared to dive into the clinical looking products, but man am I glad it did. Behind their somewhat uninspiring packaging is some seriously awesome quality stuff. My favorite product that I've tried from the brand is the Advanced Retinol Pore Refiner. It aims to minimize the appearance of pores and I've actually been able to tell that it's working. More often than not products like these just manage insecurities rather than actually doing anything. The packaging is well thought out, the cream sinks into the skin without much effort, and it feels hydrating when applied. The proof is in the pudding with this one. The Repair & Protect Moisturizer and the Multi-Action Restorative Cream are very similar in appearance, consistency, and texture. Honestly I can't really tell them apart when it comes to what they do for my skin. But after using both of them separately and together, my skin does look healthier, happier, and more moisturized. That's really all I'm looking for in my skincare anyway. 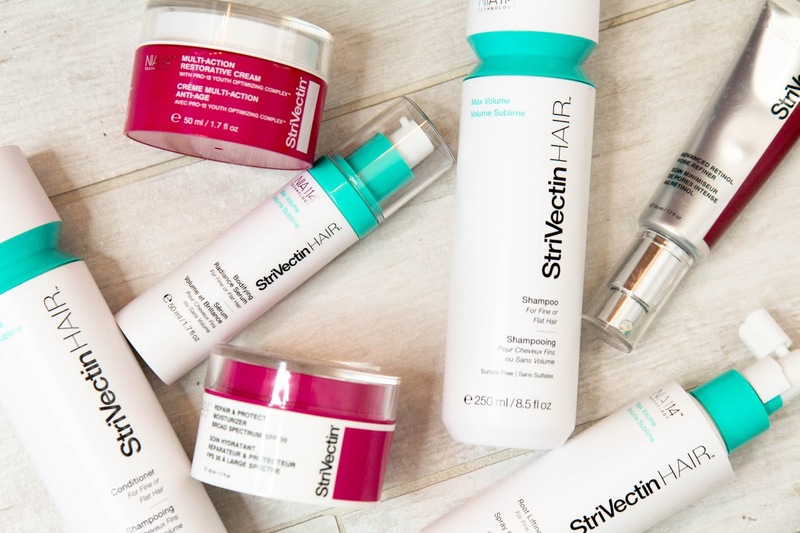 StriVectin recently introduced a hair care line that has me questioning my deep obsession with my current hair routine. Which is probably for the best since I'm downright awful at branching out in the hair department. Their shampoo and conditioner are good at getting hair clean, but it's the Root Lifting Spray and Bodifying Radiance Serum that I've really been enjoying. The root lifting spray leaves my hair more volumous without feeling sticky. It doesn't hold up all day, but the lift does last a good chuck of time and doesn't leave my hair looking oily and flat after it wears off. The radiance serum helps my hair look shiner and healthier without weighing it down or making it look greasy. All good things. Now the worst thing about StriVectin is the price. You're definitely paying a pretty penny for their scary-looking products, but at the same time you're getting quality products and a lot of it. It's a hard sell for someone like me who can barely muster taking off her makeup every night let alone dishing out serious money for skincare. Yet if you take skincare much more seriously than I do, you may want to invest. StriVectin makes good products, it's true. But the price is definitely a turn off. Have you tried StriVectin before? Who Even Reads Blogs Anymore? !